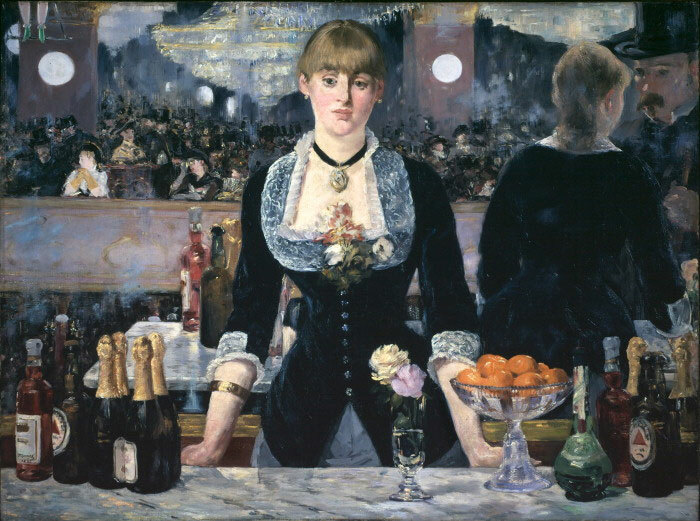 A Bar at the Folies Bergère has been interpreted and re-interpreted without losing its mystery. Born into the haute bourgeoisie, Manet was a bohemian and a flaneur, an aesthete and a Naturalist, a dandy and a loving husband. As complicated as his paintings, he is recognised as the first Modern. The most famous variety theatre in the world, a synonym for pleasure of every conceivable kind, the Folies-Bergère was the first great blooming of 'Gay Paree'. In 1871 Paris was both occupied by a foreign army and then swam with the blood of thousands killed during the ruthless repression of the ill-fated Commune. Within a decade it was preparing for La Belle Époque. What do visitors to the Courtauld Gallery think?